Endhiran – Watch the movie, watch the channels, watch the joy on the viewers coming out of the theatres my choice of title would certainly not be confronted as an exaggeration. The tinsel world is spellbound with joy that a Kollywood production is creating ripples across global frontiers. The Endhiram team would have expected soaring success but not to this magnitude. The coffers are overflowing. Conceptualised at a Kollywood studio for the Kollywood and bollywood screens ,the laurels are echoing at Hollywood too. I was stepping out of one of the state of the art Cineplexes in Chennai when I heard a comment, I would rather say a compliment from another viewer whose words just brushed past me, "Oh my god, I am yet to watch it many more times to read between the lines of the Endhiran team's technical and technological expertise. I find something refreshing each time, the Super Star's unmatched performance, Director Shankar's simply superb storyline and screenplay, A R Rahman's mellifluous music, Sabu cyril's scintillating cinematography, World beauty Aishwarya Rai's subtle yet strong performance, Vairamuthu’s lyrical splendour making the song sequences seam well with the situations, the lightly painted comedy by the emerging duo, Santhanam and Karunas, the enthralling locations for the song sequences etc, etc.” Overhearing him made me realize that he is watching it for the seventh time within a span of three days of its release and believe me I saw him coming out freshly enthralled, passing comments as though a first time viewer. It truly moved me. Super Star Rajini if we say has truly become a global star overnight, it will not be an exaggeration. My friend from New York buzzed me after watching the first show, knowing that I am yet to watch it she just made one wholesome line, 'I have never before seen so many foreigners watch a Tamil film for that matter any movie from the Indian shores. They not only watched but enjoyed thoroughly too.' That probably will suffice in one line lakhs of compliments that are still pouring in. The four pillars of the Endhiran team- Super Star Rajini, Sun Pictures, World beauty Aishwarya Rai and Oscar Awardee A R Rahman have given their best to shape this master piece of Director Shankar. Avid readers of Sujatha's novels expressed a mild tinge of sorrow that they missed him who would have rejoiced his contribution to this skyrocketing creation touching new horizons. Like the robots turning their heads in the movie, this movie has made the global viewers and in particular the entire world turn towards the Tamil tinsel world. Endhiran has created a new landmark that will be a prestigious tag of reference for any entrant into the world cinema. 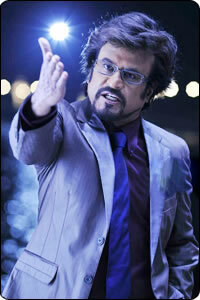 Rajini usually creates magic in two ways besides his acting prowess. Either he creates a sequence of mind boggling styles or a particular new style in eye catching sequences. In this movie the Director has infused both styles and sequences as Rajini the Robot races in par with Rajini the Scientist. The fear that was dwelling deep in most of the viewers' minds was that the super hype created by the audio launch and the special pre-release trailers should not be disappointing because its their super star's movie. It is well known that expectations create disappointments then what will be the fate of super expectations created worldwide. After watching the movie and the reviews that are flowing in probably creating new records, it is a heartfelt feeling that the super duper expectations triggered have not gone in vain. In fact all laurels to the production house Sun Pictures for having had confidence in the team to shell for such extraordinary and extravagant expenses. Greater appreciations for their marketing competency right from the fantabulous audio launch in Malaysia to the trailer launch, all executed with a USP and absolutely with no fear of hiking the Rajini fans' expectations. Thank goodness, the flaunting hopes created by the Sun Pictures’ Head Kalanidhi Maran have not been belied. Salutations to the production house for having encouraged the making of such a world class movie. It’s a movie that has been worth the long wait. Science fiction from the shores of Kollywood picturised in an absolutely international style without compromising on the expectations of the die hard fans of Rajini and Shankar is by itself a great achievement. It is the most difficult task to cater to the satisfaction of millions across the world. Rajini's style and new avatar as the Robot has certainly appealed to the masses across frontiers but more so the best treat to today's generation. I could see the theatre reverberate with bearable whistles and lovable hoots all through Rajini's presence as Robot on screen and the last 20 minutes kept everyone glued to their seats. This movie has certainly touched all the viewers sans any barrier. For a Rajini movie this may not be new because I have seen a crawling toddler enjoy Rajini on screen if not in par with a teen or an octogenarian. Super Star has always held the magical wand of impressing beyond barriers be it age, language or countries which still is amazingly growing leaps and bounds with every passing moment. It is well known that Shankar has a separate class of followers but the real surprise is all about a Shankar's movie for the first time impressing a kinder gardener, a teenager and a senior citizen and making them sit through the three hour spell with not a spec of restlessness. Maybe still the reason being Rajini on screen, but the complete credit to Shankar for having given Rajini a totally new image - the hot happening brand today ‘Robot’ when the world is daunted and haunted by computer freaks and the IT geeks. Every component in Endhiran gels so well with the storyline that nothing can be discarded as an added tag on or ignored as an extra fitting. Everyone has given their best to give life to the characters that Endhiran is finally full of life bouncing with joy. Sun Pictures has given the motivation and the necessary push to put this inspiring creation on the world map. It is sure to surpass records and create new benchmarks. Sure to create history to go down in the books of world cinema. A movie for the scientists, a movie for the dreamers, a movie for the Rajini fans, a movie for the Oscar winner A R Rahman’s admirers, a movie for the music lovers, a movie for Hollywood movie buffs, a movie for writer Sujatha's fans, a movie for graphic geeks, what else and what not. Most of all a perfect movie for the common man who just enjoys a three hour entertainment with absolutely well defined and distinctly designed shades of romance, comedy, fight sequences, songs and of course a gripping storyline. These days a weak storyline and screenplay cannot scrape through to even minimal success, mind you even with the strongest star cast. Kudos to the entire team of Endhiran. My heart like any other viewer, will not be at peace if the ultimate credit is not given to Director Shankar for having conceived to venture into a totally novel path in film making and having found the right hands and hearts to give life to his dream of a decade. Let many more such pieces of Art emerge from the floors of Kollywood to craft magic around the globe. Indian cinema’s past and present can boast of cream of the creators who have given fine movies touching new heights each time. This time it’s been Endhiran surpassing old records. Endhiran would certainly have triggered many a spark in the Directors waiting to make their debut to start thinking ‘out of the box’ to make an ‘out of the reach’ impact. Days are not far away when Director Shankar’s creations may top the Hollywood charts. We will wait to lift our collars again with pride and joy.